We have an architectural sheet metal division that specializes in installing ACM panels. These panels offer a clean, modern look to building facades in the industrial, retail, and distribution industries. ACM panels are becoming more and more popular this day in age. Many medical facilities, car dealerships, and corporate offices have gone to ACM panels for their store fronts. 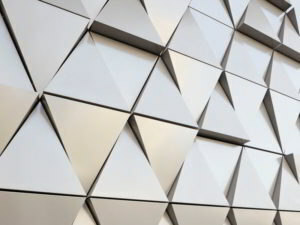 Whether you are building a new facility or just need a face lift to the building you currently occupy, let us help you reach your aesthetic goals with the installation of ACM Panels. Multiple colors, shapes, and sizes are available. Ray Roofing is also an installer of Insulated Metal Panels, often used in freezers and coolers in the food processing industry. Ray Roofing is well versed on the regulations within the food processing industry and can work diligently to comply with such standards while installing your panels in a timely fashion. To learn more about the benefits of choosing Ray Roofing for your architectural metal needs, please contact us today. 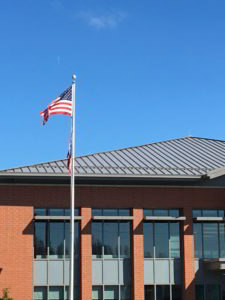 Ray Roofing offers standing seam metal roof installation and repair services throughout the state of Ohio, including in the Cleveland, Akron, and Columbus areas. Whether you need a repair to your current standing seam metal roof or your business needs a replacement roof and you want to go the standing seam route, Ray Roofing can help. There are many benefits to a standing seam metal roof; for starters, a standing seam metal roof is aesthetically pleasing thanks to its vertical panel look. Moreover, it has a long life expectancy and is extremely durable, ensuring your roof can withstand high winds, snow and other inclement weather conditions we face in the Northeast. In addition, standing seam roofs have a class A fire rating and they are quite energy efficient, making them an ideal option for industrial businesses. Metal roofing panels are advantageous to business owners for many reasons. For starters, metal roofs are fire resistant, energy efficient and are known for their durability and longevity. For those reasons and more, metal roofing is a popular choice for commercial and industrial businesses. Ray Roofing is renowned for being the industrial roofing experts in Northeast Ohio. We have helped businesses in an assortment of industries find the best roofing solutions for their needs, including steel mills, processing and chemical plants, hospitals, retail centers and more. We specialize in both roof replacements and roof repairs. If your business is in need of a full or partial replacement, we can handle the project without disrupting your day-to-day operations, as many of our projects have been completed while the owner and employees are in the facility, and we will work diligently to accommodate your needs. Whether you need a repair done to your standing seam roof or you’re interested in having a whole new roof installed, the experts at Ray Roofing can help. For more information, please call us today or fill out a contact form.